The Improved Delivery of Cardiovascular Care (IDOCC) project was a practice facilitation program conducted in eastern Ontario from 2008 to 2012.11–13 Trained PFs worked with nearly 200 primary care providers in 84 family practices across the Ottawa region to help improve their delivery of evidence-based care for patients with or at risk of cardiovascular disease (CVD). The PFs began the intervention by conducting manual audits of 66 randomly selected charts from each practice in order to assess the practice’s preintervention performance in areas pertaining to patient cardiovascular health. Practices received copies of these audits and worked with PFs to set goals and target areas in need of improvement. The PFs aimed to visit practices every 3 to 4 weeks during the first year of participation and every 6 to 12 weeks during the second year; however, PFs did not reach this objective and were only able to visit practices an average of 6.6 times in the first year and 2.5 times in the second.13 Our study of IDOCC used a stepped-wedge randomized controlled trial design, which involved 3 steps, to evaluate its effect on providers’ adherence to evidence-based guidelines, as reflected by a composite score measured at the patient level. A composite score was chosen instead of an individual primary outcome to provide an overall picture of each practice’s performance.12 The composite score included process indicators for assessing blood pressure, lipid profile, waist circumference, smoking status, glycemic levels (for patients with or at risk of diabetes), kidney function, prescriptions, and referral to smoking cessation programs. Upon completion of the analysis, the project showed no effect on the primary outcome of provider adherence to guidelines.13 We have thus endeavoured to explore the reasons for this lack of effect. We have thus endeavoured to use a comprehensive, multilevel framework developed by Chaudoir et al19 as a lens through which we can structure the barriers and facilitators experienced by 2 case exemplar practices during IDOCC’s implementation. Exploring these barriers and facilitators through a detailed case study will provide insight into the challenges IDOCC encountered in achieving its outcomes. Our results will be of interest to those looking to establish practice facilitation programs in their own jurisdictions. This study used a retrospective qualitative case study design to examine the barriers to and facilitators of IDOCC’s implementation identified by PFs. The Ottawa Health Science Network Research Ethics Board provided ethics approval for this study. Our study drew data from narrative reports that PFs completed after every encounter with practices, be it in person, over the telephone, or by e-mail. These reports included information on the practices’ goals for the program, the activities they conducted, and the barriers to change that they perceived. The PFs were encouraged to complete their reports immediately after their encounters with the practices. All 4 of the PFs held master’s degrees in fields related to medicine or health science. In addition to having previous clinical or managerial experience, PFs underwent 7 weeks of intensive training on quality improvement and change-management techniques. Narrative reports were selected using a multistage purposeful sampling approach.20 Of the 84 practices that participated in the study, 76 possessed a complete set of narratives. We calculated the sum of the final postintervention composite scores for each practice in order to determine their performance relative to their peers. For each IDOCC condition indicator (eg, diabetes, smoking prescription), we identified practices that scored below 50% of the ideal score and those that scored below 10% of the mean value of their peers on the same indicator. Practices meeting these criteria were assigned a priority code of 1 for that indicator, indicating it was a top priority item. Indicators were summed and practices that fell outside of ± 1 SD of the total mean score were excluded from the sample. The 51 practices included at this stage were considered “typical cases,” in that they did not deviate substantially from the mean. In order to provide a more in-depth picture of the implementation process, 2 case exemplars were selected from this data set based on the richness and depth of information provided in PFs’ reports and their representation of more common IDOCC practice types. These cases were reviewed in detail to support, deepen, and compare the pattern of results over the 3 project phases, each of which encompasses approximately one-third of the time during which the PF engaged with the practice: planning (phase 1), implementation (phase 2), and sustainability (phase 3). A research associate quantified information from the 2 case exemplars using Excel and then visually displayed and described patterns over time. The 2 practice sites selected for this study varied in terms of practice model (community health centre [site A] vs family health group [site B]), the number of narratives completed (12 vs 29), and the PF assigned to them (PF 1 vs PF 2). Table 2 presents the barriers and facilitators present in both sites over the 3 study phases. Practice site A is a community health centre. These clinics typically consist of interdisciplinary teams that have an expanded scope of health promotion and outreach services, and that focus on specific patient populations that might face barriers to securing health services.25 The practice was involved in IDOCC for 12 months, shorter than the average 2-year period for a typical IDOCC practice, as it received the intervention in the trial’s final step and thus data from its sustainability phase were not included in the findings of the original trial. Numerous providers work at this practice, including physicians, nurse practitioners, nurses, a dietitian, and a chiropodist. Upon completion of the practice’s performance audit, 3 priority areas of focus arose: 1) obtaining target levels of screening frequency for hemoglobin A1c measurement at first and second readings for patient with diabetes mellitus; 2) achieving target levels of screening frequency for low-density lipoprotein cholesterol measurement among patients with chronic kidney disease; and 3) improving rates of smoking reduction through patient counseling, referral to smoking cessation programs, or prescription of pharmacotherapy. The practice focused on improving diabetes management, reassured by the PF that “[hemoglobin A1c] was an issue and maybe they should focus on that” (May 2010). It created a diabetes team and worked toward systematic recall and planning a registry supported by the electronic medical record (EMR). Providers received educational resources that they could distribute to patients in order to support better management of their conditions. These included leaflets instructing patients on how to test their blood sugar levels and “passports” or record cards allowing patients to track levels and observe their behaviour over time. The PF also offered a description of the service options provided by the Diabetes Regional Coordination Centre in order to provide additional support options. In terms of smoking reduction, the PF provided the site with smoking cessation guides, details of community-based studies and programs (eg, Smoking Treatment for Ontario Patients program26 and the City of Ottawa ACESS program27), and information about learning webinars. The narratives provided no information on how the site addressed chronic kidney disease or whether this target area was addressed at all. The site also directed its efforts toward addressing other indicators or procedures outside of the priority areas identified by the PF. These items included screening for depression, developing a hypertension clinic, and engaging in patient waist circumference measurement. Figure 2 provides the number and type of barriers and facilitators for site A across the 3 program phases (planning, implementation, and sustainability). The narratives for the site reported more barriers (n = 47) than facilitators (n = 38). Most of the barriers involved organizational (n = 17; 36% of all barriers reported) and provider factors (n = 17; 36%). Organizational barriers peaked during the implementation phase. At this point in the program, the site was preoccupied with training and adjusting to a new EMR system. In addition, the site leader left the practice without appointing a replacement. Provider barriers were consistent across the 3 phases and pertained mostly to staff attitude toward changing practice behaviour. Specifically, staff members noted that they were unable to find the time necessary to meet with the PF, as “every minute was going into EMR training” (September 2010). The introduction of the EMR seemed to “freeze” the IDOCC process for several months. The site expressed frustration with the lack of progress. Site members also expressed concerns regarding scope of practice and whether staff skills were being used optimally. Innovation barriers involved the site’s initial failure to comprehend or agree with certain recommendations, such as questioning the value of measuring waist circumference as an indicator over assessing body mass index. Also, the site engaged in numerous activities outside of agreed-upon priority areas, despite the PF’s caution that it was “often good to focus on one area at a time and define exactly what you were going to do otherwise projects morphed into each other and it was then difficult to see what had worked” (May 2010). These barriers were substantial during the planning phase, but decreased over time. Few structural and patient barriers were reported. Facilitators were most often associated with innovation (n = 14) and structural (n = 11) factors, and were reported most prominently during implementation. The site embraced IDOCC support, was open to the idea of planning and change, and was eager to improve its management of patients with chronic conditions. Likewise, site members expressed appreciation for the PF’s ability to incorporate knowledge or tools from other sites. The PF successfully introduced a number of resources used by other IDOCC practices, such as low-literacy handouts and screening tools for depression, and offered insight into alternative strategies for care delivery used by different sites. Structural facilitators mostly involved linking the site to resources in the community, such as pharmacists (who could provide MedCheck visits) and the YMCA-YWCA. 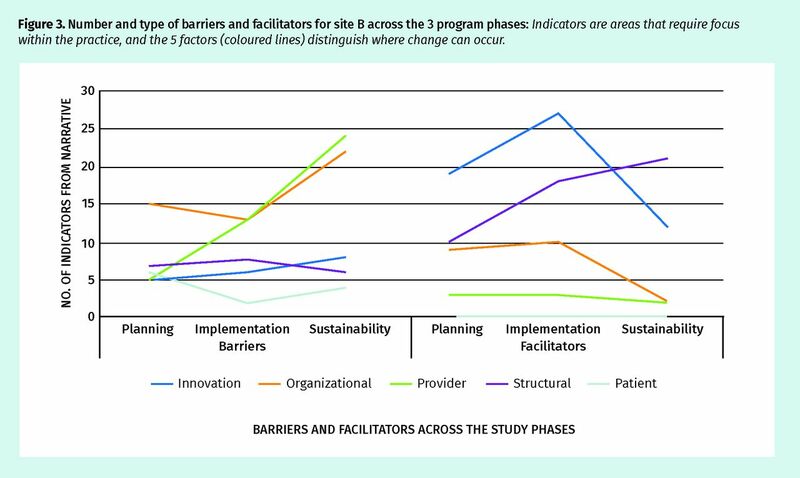 Structural facilitators were least frequent during the implementation phase, the same phase during which organizational barriers were most common. Practice site B is a family health group, a team-based family practice model in which 3 or more physicians work within a clinic and share office staff. Only 1 physician was directly involved in IDOCC for 24 months and is the focus of this narrative. A relatively high-performing practice, the site was already performing well along many measures addressed through the IDOCC program. The PF’s practice audit identified smoking cessation as the main area of need. The PF worked with the site to support smoking cessation through various means, including counseling, referral to outside groups, and pharmacotherapy (eg, nicotine patches or gum). To support this improvement, the PF provided the practice with booklets and flow sheets on smoking cessation and informed the physician about local and provincial programs designed to help patients quit smoking. These included the Smoking Treatment for Ontario Patients Program,26 which delivers treatment and counseling to patients free of charge. Further, a great deal of effort was put into assisting the physician with becoming more efficient in scheduling appointments, managing patients, and charting. Early on, the physician indicated that his present system was particularly cumbersome, redundant, and lacking in reminder or flow-sheet systems that integrate CVD prevention and management. In order to improve this aspect of the physician’s practice, the PF introduced a waiting room screening form that asked patients about the reason for their visit and lifestyle information associated with CVD prevention and management; offered a number of flow sheets and assessment forms such as the Framingham Coronary Heart Disease Risk Assessment Tool and a CVD and diabetes flow sheet for high-risk patients; and encouraged the physician to type his notes directly into the EMR to avoid duplication of work. 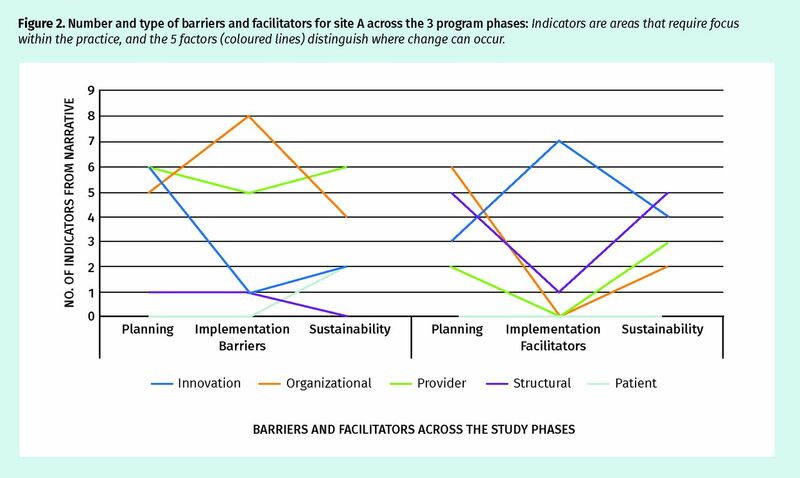 Figure 3 shows the number and type of barriers and facilitators across the 3 program phases for site B. Barriers (n = 144) and facilitators (n = 136) were fairly balanced at this site. Most of the barriers involved organizational (n = 50) and provider (n = 42) factors, both of which peaked during the sustainability phase. Two physicians left the practice during the planning phase, considerably increasing the patient case load of the physician involved in IDOCC. Further, the lack of organizational efficiency and negative attitude toward change limited the practice’s capacity to embrace and sustain IDOCC. The physician was frequently overbooked, behind schedule, under pressure, tired, and frustrated: “I don’t have a life. I don’t get to the gym. I eat supper only after 8 PM. I know why people leave medicine to do something else” (May 2009). These issues appeared to affect patients as well. The PF reported one incident in which an angry patient, after expressing frustration at the long and frequent waits to see the physician, began verbally abusing and threatening staff before ultimately being escorted out by police. Despite facing sizable scheduling challenges, the physician did not complete flow sheets, which could have helped to improve efficiency and provided incentive payments for eligible procedures. The physician dismissed the flow sheets as “just another task to perform along with [the] seemingly endless charting, billing, and administrative obligations” (May 2010). The physician’s failure to complete flow sheets comprised the greatest innovation-level barrier reported by the PF. The narratives also indicated that the physician lacked time to fully complete patients’ charts, yet was unwilling to make improvements that could have expedited this task such as learning to dictate notes. Office staff support was limited, and the PF reported finding “underlying tensions and frustrations due to … inconsistent work practices and time-management skills” (October 2010). After claiming that he was “drowning in paperwork” (June 2010), the physician considered hiring additional support to assist in charting and billing. However, no changes to this effect were reported in the narratives. Patient and structural barriers were very much tied together. For example, the narrative noted the difficulty that the physician found it necessary “to balance time spent with patients and remuneration that can be billed” (March 2010), resulting in a perceived conflict of personal and work values. The physician had indicated to the PF that “sometimes I feel as if I am working for [the Ontario Health Insurance Plan] for free” (February 2009); most of the physician’s patients had complex physical and psychological problems that required long appointment times. Learning about community resources available to patients was the biggest structural facilitator and was reported most frequently during the sustainability phase. The most commonly cited programs or initiatives pertained to diabetes treatment or management. Organizational facilitators involved a few changes made to improve office efficiency, including the willingness to pilot the patient problem identification tool during implementation. The PF reported few provider and no patient facilitators. Both practices encountered a variety of barriers and facilitators throughout the program’s 3 phases. The case studies revealed the complex interactions of these factors. Further, exploring the 2 case exemplars highlighted in this study reveals a number of key lessons that could potentially inform subsequent interventions in primary care practice facilitation. The first lesson underscores the limits of performance audits in informing subsequent practice change. While audit findings are key to identifying which indicators require focus during the IDOCC trial, a broader knowledge about practice readiness and functioning is necessary to deal with underlying issues affecting the practice’s capacity for change. For instance, the disorganization and excessive workloads reported in site B made adoption of new strategies a challenge, as they negatively affected physician morale. Another issue raised by the case studies was the way in which multiple barriers can reinforce one another, making it difficult to address a root cause. This was seen in site B, where a confluence of barriers at the organizational, patient, and structural levels acted as a substantial impediment to change. The physician was often unable to complete patients’ charts (patient-level factor), but chose not to develop tools that could expedite the process (structural), citing a lack of time and excessive case load (organizational). Fortunately, facilitators exhibit a similar compounding effect, as was also the case in site B. During the sustainability phase, the physician’s positive reaction to the PF’s advice (innovation-level facilitator) encouraged him to learn about and refer patients to community resources (structural). Last, barriers and facilitators tended not to remain constant throughout the 3 phases of the intervention, but rather peaked at different points. In many cases, these “peaks” are likely context dependent. This could be seen in site A, where organizational barriers peaked during implementation in conjunction with the launching of a new EMR service. Additionally, some barriers might go through “natural stages,” as they comprise an inherent part of the adoption process. For instance, site A exhibited innovation-level barriers during planning, when physicians expressed reluctance to follow new strategies for measuring obesity (waist circumference vs body mass index). These barriers tapered off over time, which might reflect the natural learning curve of physicians faced with changing a previously established practice. Our study has some limitations. We are limited by examining only 2 cases. Our analysis relies on PFs’ reports of the implementation process and therefore depends on each PF’s perception and relationship with members of the practice. Different PFs could potentially choose to include different levels of detail in their reports. While we selected practices that differed in a number of ways as our 2 exemplars, the nature of our case study limits its generalizability to other types of practices. Our exploration of the 2 chosen cases provides insight into the possible causes of IDOCC’s null effect. The case exemplars exhibited a variety of barriers and facilitators, which fluctuated over the intervention’s 3 phases. Chaudoir and colleagues’ framework19 provided a useful lens through which we could compare the challenges faced by both practices. Both practices exhibited similar ratios between constructs as barriers and facilitators, with organizational- and provider-level barriers and innovation- and structural-level facilitators being most common in both sites. Our findings suggest the importance of applying models such as Chaudoir and colleagues’ framework while implementing innovations, as they provide an effective means of identifying and addressing the complex interplay between barriers and facilitators. While frameworks act as an important lens through which innovators can view implementation, the needs and challenges to be addressed will vary between locations. An in-depth exploration of the target site is thus vital to account for barriers and facilitators in place in multiple constructs. ▸ The Improved Delivery of Cardiovascular Care project aimed to use practice facilitation to help practices in eastern Ontario deliver better evidence-based cardiovascular care; however, analysis of the project did not reveal a clinically significant outcome. ▸ The authors conducted a retrospective qualitative study using 2 cases selected from practice facilitators’ narrative reports to identify the barriers and facilitators contributing to program implementation in 2 participating practices. ▸ The analysis relied on a 5-factor framework (structural, organizational, provider, patient, and innovation) to contextualize the findings, and will be of interest to individuals implementing practice facilitation or other quality improvement programs. ▸ Le projet Improved Delivery of Cardiovascular Care visait à utiliser des facilitateurs de pratique pour aider les établissements de santé de l’Est de l’Ontario à dispenser des soins cardiovasculaires fondés sur des données probantes; l’analyse de ce projet n’a toutefois révélé aucun résultat significatif. ▸ Les auteurs ont effectué une étude qualitative rétrospective en choisissant 2 cas de rapports narratifs traitant de facilitateurs de pratique afin d’identifier les facteurs qui font obstacle à la mise en œuvre du programme et ceux qui la facilitent, et ce, dans 2 établissements participants. ▸ L’analyse portait sur 5 facteurs (la structure, l’organisation, le soignant, le patient et l’innovation) afin de remettre les observations dans leur contexte, un aspect qui intéressera les personnes qui mettent en œuvre les facilitateurs de pratique ou d’autres programmes pour améliorer la qualité de soins. Dr Liddy contributed to the study design and oversaw the study’s implementation, data analysis, and manuscript preparation. Dr Rowan and Ms Valiquette-Tessier facilitated data collection and conducted the analysis. Mr Drosinis and Ms Crowe contributed to the data analysis. Dr Hogg conceived of the idea, arranged initial funding, assisted with implementation, and contributed to the data analysis. All authors helped draft, read, and approved the final manuscript and agree to act as guarantors of its contents.
. An overview of practice facilitation programs in Canada: current perspectives and future directions. Healthc Policy 2013;8(3):58-68.
. Navigating change: how outreach facilitators can help clinicians improve patient outcomes. J Am Board Fam Med 2012;25(2):232-7.
. Practice facilitators: a review of the literature. Fam Med 2005;37(8):581-8.
. Effect of facilitation on practice outcomes in the National Demonstration Project model of the patient-centered medical home. Ann Fam Med 2010;8(Suppl 1):S33-44.
. Practice facilitation and academic detailing improves colorectal cancer screening rates in safety net primary care clinics. Implement Sci 2015;10(Suppl 1):A57.
. Practice facilitation to improve diabetes care in primary care: a report from the EPIC randomized clinical trial. Ann Fam Med 2014;12(1):8-16.
. Improving prevention in primary care. Evaluating the sustainability of outreach facilitation. Can Fam Physician 2008;54:712-20. Erratum in: Can Fam Physician 2008;54:851.
. A controlled trial to integrate smoking cessation advice into primary care practice: Doctors Helping Smokers, Round III. J Fam Pract 1992;34(6):701-8.
. Cancer: improving early detection and prevention. A community practice randomised trial. BMJ 1992;304(6828):687.
. Primary care quality improvement from a practice facilitator’s perspective. BMC Fam Pract 2014;15(1):23.
. Improved delivery of cardiovascular care (IDOCC) through outreach facilitation: study protocol and implementation details of a cluster randomized controlled trial in primary care. Implement Sci 2011;6:110.
. A real-world stepped wedge cluster randomized trial of practice facilitation to improve cardiovascular care. Implement Sci 2015;10:150.
. Physician perspectives on a tailored multifaceted primary care practice facilitation intervention for improvement of cardiovascular care. Fam Pract 2016;33(1):89-94. Epub 2015 Dec 6.
. Towards a common terminology: a simplified framework of interventions to promote and integrate evidence into health practices, systems, and policies. Implement Sci 2014;9:781. Erratum in: Implement Sci 2014;9(154).
. Planning and studying improvement in patient care: the use of theoretical perspectives. Milbank Q 2007;85(1):93-138.
. The role of theory in research to develop and evaluate the implementation of patient safety practices. BMJ Qual Saf 2011;20(5):453-9. Epub 2011 Feb 11.
. Measuring factors affecting implementation of health innovations: a systematic review of structural, organizational, provider, patient, and innovation level measures. Implement Sci 2013;8:22.
. Qualitative evaluation and research methods. Beverly Hills, CA: Sage Publications; 1990.
. Basics of qualitative research: grounded theory procedures and techniques. Beverly Hills, CA: Sage Publications; 1990.
. Bridging the implementation gap between knowledge and action for health. Bull World Health Organ 2004;82(10):724-31.
. A Practical, Robust Implementation and Sustainability Model (PRISM) for integrating research findings into practice. Jt Comm J Qual Patient Saf 2008;34:228-43.
. Improved Delivery of Cardiovascular Care (IDOCC): findings from narrative reports by practice facilitators. Prev Med Rep 2017;5:214-9.
. CHC fact sheet. Toronto, ON: Association of Ontario Health Centres; Available from: https://www.aohc.org/chc-fact-sheet. Accessed 2017 Dec 19.
. Smoking Treatment for Ontario Patients (STOP) program. Toronto, ON: Centre for Addiction and Mental Health; 2011. Available from: https://www.nicotinedependenceclinic.com/English/stop/Pages/Home.aspx. Accessed 2016 Jan 22.
. ACESS (Accessible Chances for Everyone to Stop Smoking). Ottawa, ON: Ottawa Public Health; 2014. Available from: http://info.cancer.ca/e/shl/shldetails.asp?srvid=12433&lang=E&pc=. Accessed 2016 Jan 27.
. Feedback GAP: pragmatic, cluster-randomized trial of goal setting and action plans to increase the effectiveness of audit and feedback interventions in primary care. Implement Sci 2013;8:142.
. “My approach to this job is ... one person at a time.” Perceived discordance between population-level quality targets and patient-centred care. Can Fam Physician 2014;60:258-66.